Quick overview Takes a closer look at the realities for people and how to deal with them. This title shows what may begin as a painful and unwanted experience can pave the way for new understandings and life chances and how psychiatric service users are coming together to bring about changes benefiting us all. Few of us would want to be a user of psychiatric services. It is a status associated with fear, stigma, isolation and disadvantage. This book takes a closer look at the realities for people and how to deal with them. It shows what may begin as a painful and unwanted experience can pave the way for new understandings and life chances and how psychiatric service users are coming together to bring about changes benefiting us all. 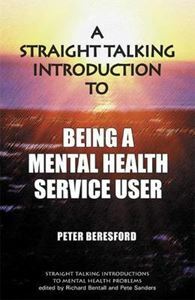 A pocket sized, good value series of succinct, thought provoking introductions ideal for students in all mental health disciplines, psychiatric service users, carers and indeed everyone with an interest in mental health. Rather than accept that solutions to mental health problems are owned by the medical professions, these books look at alternatives and provide information so that the users of psychiatric services, their families and carers can make more decisions about their own lives.